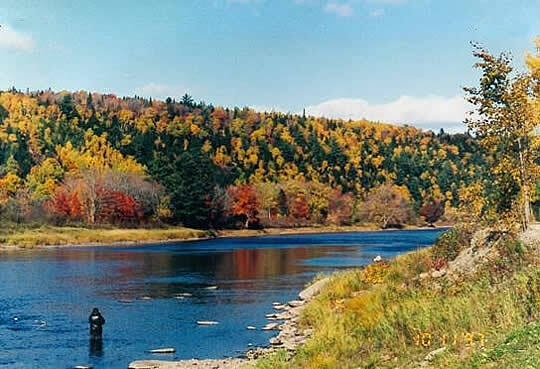 The Miramichi River system has an average annual spawning run of approximately 50,000 Atlantic salmon making it the most prolific Salmon River in all of North America . 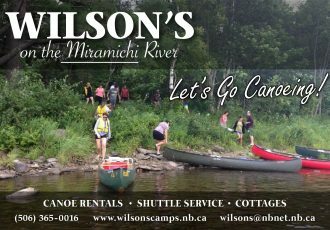 Among its many branches, the Main Southwest Miramichi enjoys an international reputation as the epicenter of this sport in the province of New Brunswick. 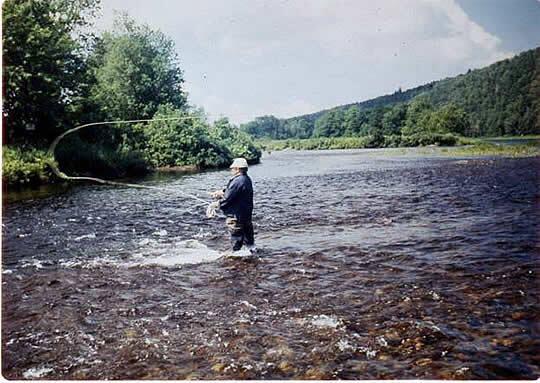 Lyons Rapids is a wide slow run that works best when the fish are moving. Wilson ‘s has ownership of the south side of this pool and the north side is Crown public water. 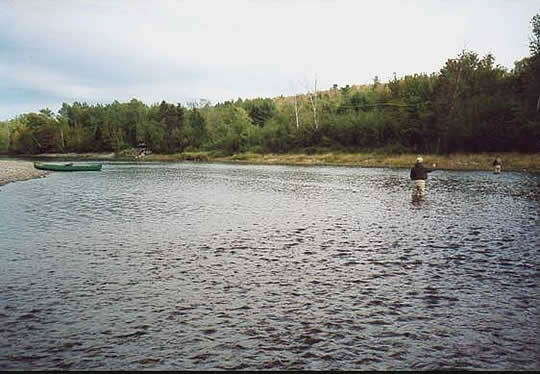 This pool usually fishes two rods on Wilson ‘s side and has a total water frontage of app. 700 feet. O’Donnell’s Landing is a fast moving run over plenty of rocks. This pool normally fishes two rods in both the summer and the fall. Total water frontage around Herb’s Island , is approximately 1,800 feet. 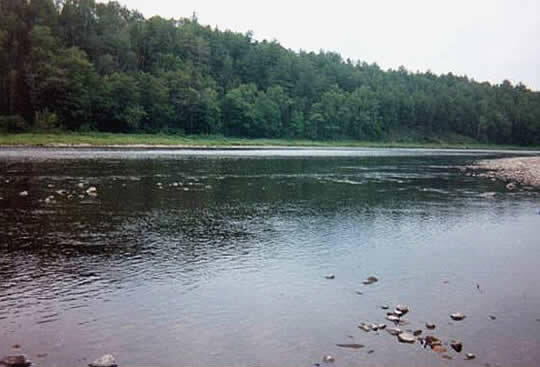 Stanley ‘s Front is a beautiful Atlantic salmon pool with a nice run that forces the fish to the south bank of the Miramichi River. The run gradually deepens into a slow moving pool over several rocks. The pool is a top producer when the water is higher than normal and can easily service up to four rods. The total water frontage around Herb’s and Stanley ‘s Fronts is app. 2,000 feet. Privacy is enjoyed here since Wilson ‘s owns both shorelines. 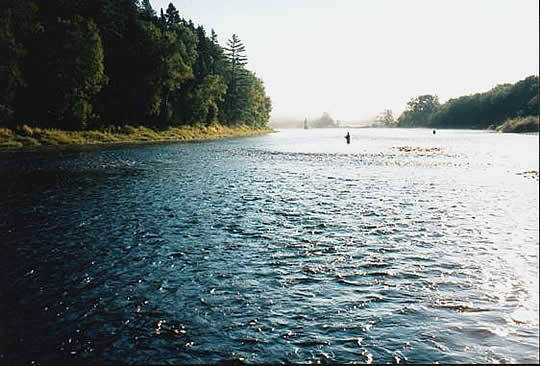 Herb’s Front is a small fast salmon run with a small pocket that is just right for one rod. The pool, which is approximately one hundred feet in length fishes best in high water. Wilson ‘s has ownership of both sides. Buttermilk is a wide slow moving pool flowing over a bed of several large rocks that fishes well in both the summer and the fall. Wilson ‘s has leased the south side of this pool that has about 1,800 feet of frontage fishing two rods until 2057. Cold Water pool gets its name from the fact that Stewarts Brook and several other small springs flow from the south shoreline into this pool. 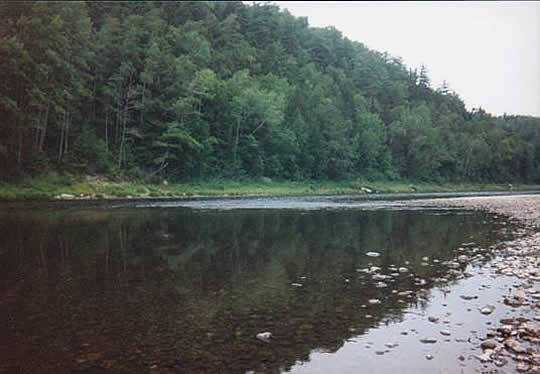 The pool, which has a wide gravel bar and a deep lower end, is a good holding pool in both the summer and the fall. The pool easily fishes four rods. Wilson ‘s owns both shorelines of the pool . Total water frontage at this pool is app. 2,000 feet. 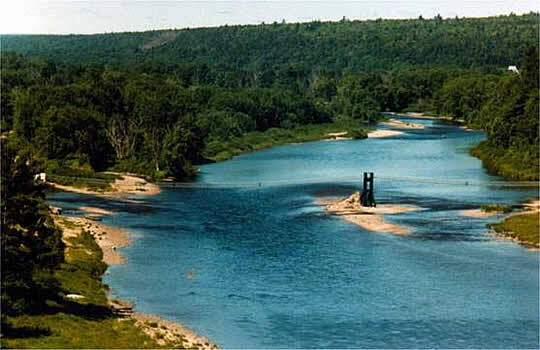 The Bridge Pool is a fast moving heavy, 400 foot, run located under the famous foot bridge spanning the Main Southwest Miramichi River between the communities of McNamee and Priceville. This pool, which can hold two rods, fishes best when the salmon are moving through. Wilson ‘s has ownership of one side. Home Pool is a fast flowing narrow run over a riverbed of large rocks. The pool is supplied with cold water from springs flowing out of the north bank and also from the ledge bottom. 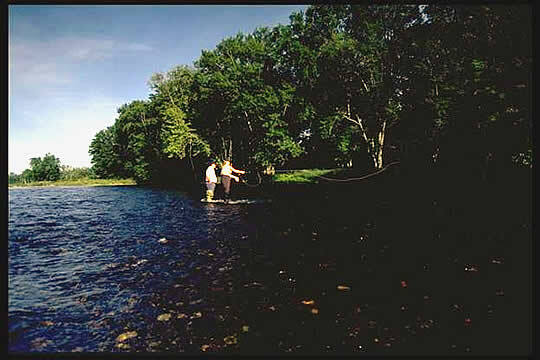 The pool normally fishes two to three rods easily from either the island or the north bank. The total water frontage for this pool, Lower Justies and Maple Island is app. 3,000 feet. Wilson ‘s has ownership of both banks. Maple Island is another small very private pool that seems to capture all the fish moving through. The pool, which is app. 125 feet in length, fishes 1 to 2 rods. Traditionally Maple Island has been a sure bet on any July morning or late evening. This pool is adjacent to Lower Justies and Home pool. Wilson ‘s has ownership of both sides.